Shiveluch volcano has grown a huge lava dome. It reaches 600 Meters tall (That’s over 1,900 feet tall!). It’s in danger of collapse and causing pyroclastic flows that would do damage up to 10KM away. Shiveluch has had over 60 large explosive eruptions during the past 10,000 years. Catastrophic eruptions took place in 1854 and 1956, when a large part of the lava dome collapsed and created a devastating debris avalanche. It belongs to the Klyuchevskaya volcano group and is about 65,000 years old. 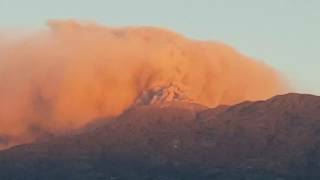 Most Amazing Volcano Eruption Footage Shots! Kadovar volcano awakens, first eruption in known history, P.N.G. Incredible Anak Krakatau volcanic eruption video!